Metroid Prime: Trilogy (MPT) was released in North America on August 24, 2009 with a MSRP of $49.99. Metroid Prime: Trilogy was the original Metroid Prime, Metroid Prime 2: Echoes, and Metroid Prime 3: Corruption, all put on one Wii disc. Metroid Prime and Metroid Prime 2: Echoes, which were originally GameCube games, were updated with Wii controls; but other than the updated controls, all the games were nearly identical to their original releases. The Metroid Prime games were developed by Retro Studios, and published by Nintendo. Metroid Prime: Trilogy received an ESRB rating of "Teen" with "Animated Blood, Violence" listed as content for gamers/parents to be aware of. How many hours have Wii owners played Samus' three adventures in the last 2 years? Let's take a look! Metroid Prime: Trilogy has about 77,607 Wii owners that have reported game-play data through the Nintendo Channel, with 735 days possibly reported. 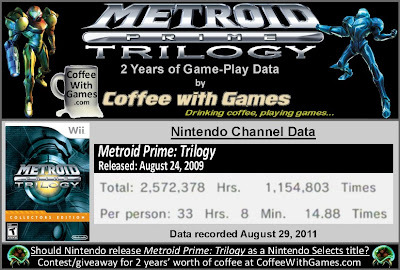 The last game-play data report on Metroid Prime: Trilogy was from data reported on August 30, 2010. 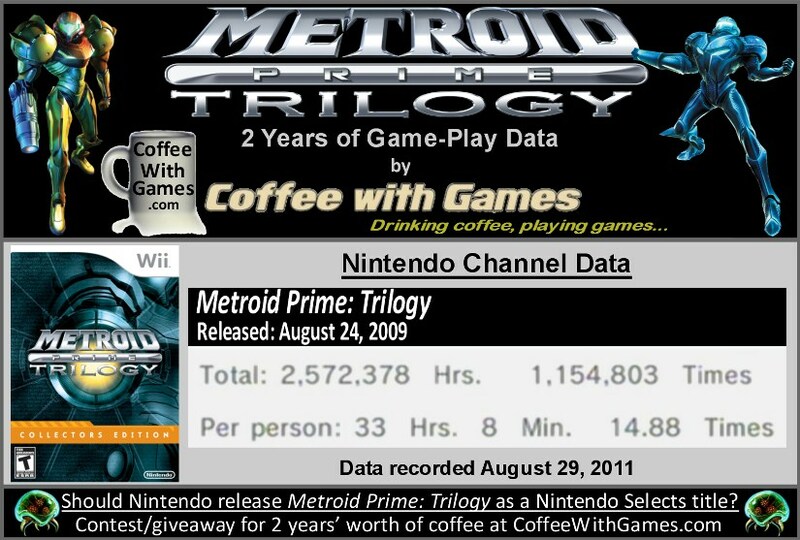 Since last year, Metroid Prime: Trilogy has seen an increase of about 21,487 Wii owners reporting data. Metroid Prime: Trilogy now has 2,572,378 Total Hours of game-play reported, an increase of 906,605 Total Hours since last August. The game's average time played is 33 Hours 8 Minutes "Per person" reporting data, which is 3 Hours 27 Minutes more than the average "Per person" was last year. Metroid Prime: Trilogy's average play-time is now just over 2 Hours 13 Minutes per day/session reported. When I broke the news that Metroid Prime: Trilogy was no longer being published/shipped from Nintendo in January 2010, the asking price of the game almost immediately went above the MSRP of $49.99 on Amazon.com from third-party vendors. Metroid Prime: Trilogy's Amazon.com sale rank is #2,534, and it is currently selling for $139.98. Metroid Prime: Trilogy's "professional" review score average is 92.27%, based on 33 reviews on GameRankings.com. The game has a 5 out of 5 Stars rating on Amazon.com, based on 104 customer reviews. MPT's customer review score average is 96.92%, when the customer reviews are converted to a 100% review scale. I purchased Metroid Prime: Trilogy from Best Buy in December 2009, for $20. I thought it was odd for Best Buy to have the game for so cheap and I didn't want to wait, because I was thinking, "$20 is less than $50!" Little did I know it was a fire sale of sorts, to get rid of the game's inventory. While I think the reported game-play data for Metroid Prime: Trilogy is good, I think it's interesting that Metroid Prime 3: Corruption, the standalone version, has had more players reporting data and more "Total Hours" reported over the last year, than Metroid Prime: Trilogy has. The two areas Metroid Prime: Trilogy is higher than Metroid Prime 3: Corruption are the average hours reported "Per person" and the number of "Times" played per person, which should be expected considering Metroid Prime: Trilogy is three games on one disc; hence, 3 x 1 = 1! I still own Metroid Prime: Trilogy, but I have not played it yet. Being that I enjoyed Metroid Prime 3 so much and I have a backlog of games, I am not sure if I'm really counting Metroid Prime and Metroid Prime 2 as "Wii games" since there isn't really new content in them, other than just new controls. I personally hope that Nintendo releases Metroid Prime: Trilogy as a Nintendo Selects title, just so new Wii owners can find it more easily, and not to mention it would be a great buy. As the data image asks, do you think Nintendo should release Metroid Prime: Trilogy as a Nintendo Selects title, or just let it be a "Collectors Edition" as the box says? If you own Metroid Prime: Trilogy, have you beaten all three games yet? 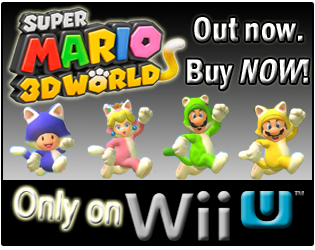 I don't really care how they release it - doesn't even have to be a selects, I'd pay the full price they originally wanted for it - I'd just like to see it offered again, but I have my doubts it will be on the Wii. 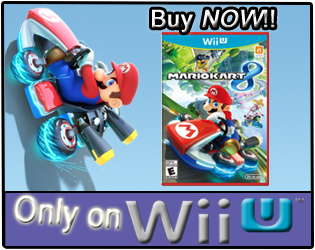 Maybe some sort of a repackage for the Wii-U eventually, but I suspect it's done-for on the Wii itself, unfortunately. Yea, considering they re-released the Super Mario All-Stars "Limited Edition", I'm surprised this wasn't one Nintendo would have continued to re-release in some form...but, I guess that idea got lost under the stacks of cash they had at the time, but now that those are getting sorted out, perhaps this will get released again in some form.